Some of vegetable and fruit dealers as well as food shops are serving unseasonal “shaved ices” in winter and spring seasons. The menu of shaved ices plays an important role in winning more customers for main businesses of those shops. “Hanayaka Market”, a vegetable and fruit shop located in Kuki-shi, Saitama prefecture, serves its guests with shaved ices throughout the year. Various fruits, being sold at the Market, are squeezed into topping juices for the shaves ices. Those juices are mixed when needed, while whip cream or cheese cream is added to the topping to make the ice more delicious. An ingredient suitable to fruits is selected from a professional viewpoint of the fruit dealer. People of the Market know very well how to prepare the best toppings by mixing fruit syrup, cream and others. “Our guests are enjoying tastes of various toppings of the shaved ice. And the tastes are incentives for those guests to purchase the same fruits used for making the toppings. Before taking the shaved ice, they have not bought those fruits. Sales of tropical fruits such as a mango are also increasing,” the owner of Hanayaka Market said. 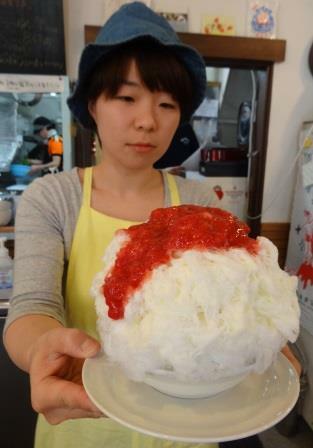 “Neiroya,” a ramen shop in Suginami-ku, Tokyo, have many visitors aiming at a shaved ice rather than a ramen noodle. Neiroya’s shaved ices topped with fruit syrup are tremendously popular. Many kinds of seasonal fruits such as fresh strawberry are directly sent to the shop by farmers in respective fruit producing areas on annual contract basis.